Set against this vivid backdrop, The Last Summer (of You and Me) is the enchanting, heartrending story of a beach-community friendship triangle and summertime romance among three young adults for whom summer and this place have meant everything. Sisters Riley and Alice, now in their twenties, have been returning to their parents’ modest beach house every summer for their entire lives. Petite, tenacious Riley is a tomboy and a lifeguard, always ready for a midnight swim, a gale-force sail, or a barefoot sprint down the beach. Beautiful Alice is lithe, gentle, a reader and a thinker, and worshipful of her older sister. And every summer growing up, in the big house that overshadowed their humble one, there was Paul, a friend as important to both girls as the place itself, who has now finally returned to the island after three years away. But his return marks a season of tremendous change, and when a simmering attraction, a serious illness, and a deep secret all collide, the three friends are launched into an unfamiliar adult world, a world from which their summer haven can no longer protect them. 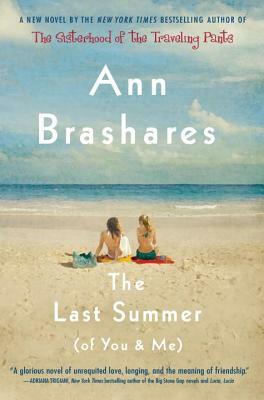 Ann Brashares is the author of the phenomenal five-million-copies-selling series of young adult novels, The Sisterhood of the Traveling Pants, The Second Summer of the Sisterhood, Girls In Pants, and Forever in Blue, and the New York Times bestselling adult novel The Last Summer (of You and Me).